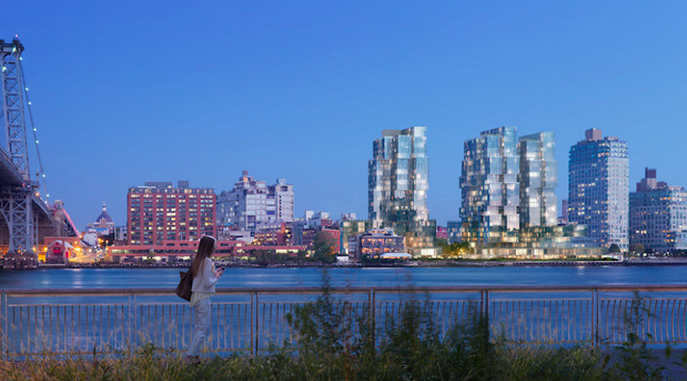 Stacked boxes are all the architectural rage these days—from Bjarke Ingels’ Two World Trade, to ODA’s Midtown skyscraper, to ODA’s Financial District skyscraper, to ODA’s Bushwick residential project, to ODA’s Williamsburg condos, to ODA’s other boxy buildings in Long Island City, Harlem, and the Lower East Side. It should surprise nobody, then, that ODA‘s latest project will stay true to the firm’s trademark form. The New York Times reported that Eliot Spitzer, the former governor and short-lived cable news host, is now heading his father’s real estate business and has tapped ODA to design his first project. The $700 million, 856-unit development sits along the East River, directly south of the Williamsburg Bridge in Brooklyn. The project appears as a collection of stacked-box towers that each rise 24 stories. ODA founder Eran Chen said the design resembles a “molded iceberg.” (For reference, here are some pictures of icebergs.) Along the river is also a new park and esplanade. “[Spitzer] said he decided to build rental housing rather than condominiums, and agreed to set aside 20 percent of the units for poor and working-class households,” reported the Times. “But with Mayor Bill de Blasio seeking to require as much as 30 percent affordable housing for what are known as 421-a projects, Mr. Spitzer wanted to get his project moving before the current regulations changed or expired this month.” This did not go over too well with some people on Team de Blasio. The Observer noted that Lincoln Restler, a senior policy advisor to the mayor, shared the Times’ story on Facebook and called Spitzer’s attempt to keep the project at 20 percent affordable “offensive.” A spokesperson for de Blasio told the Observer that Restler’s comments did not necessarily reflect the thinking of the administration. Either way, the Facebook post has been deleted.